Every Christmas Eve, Illinois resident Richard Goodson gathers around the television with his wife and children and watches the classic holiday movie 'It’s a Wonderful Life.' The 1946 film is an inspiration, and an escape, for Goodson. When he watches 'It’s a Wonderful Life,' he is able to appreciate where he is in his own life. And that makes the man feel good. Twenty years ago, Goodson started to collect vintage 'It’s a Wonderful Life' memorabilia and autographs. He now owns thousands of collectibles from the film. The movie has also fueled a desire to share his collection with others. He said the film, and the memories it evokes, has a powerful effect on people. 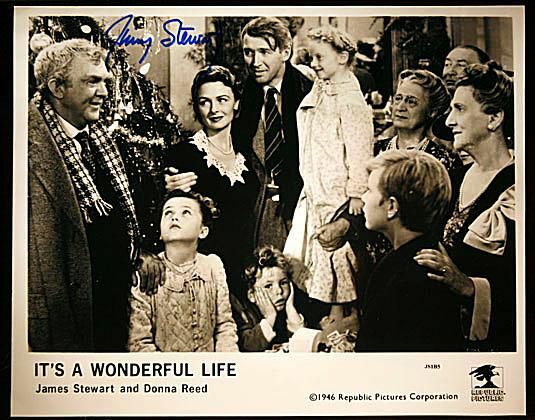 The first collectible Goodson obtained was an 8 x 10 black and white photograph of the Bailey family signed by Jimmy Stewart, who played George Bailey in the film. It was given to him by his wife, Coleen. That gift has now multiplied into close to thousands of related items. Goodson has received pieces from all over the world. “Everyone that touched the movie, I have something of,” he said. “Autographs, stills, Christmas cards, scripts, financial documents—you have to be in it for the hunt.” Godson’s celebrity memorabilia collection is, no doubt, one of the largest of its kind in the world. Ask Goodson what his favorite 'It’s a Wonderful Life' collectible is and the answer is easy. He has a strong affinity for an album page signed by Jimmy Stewart, Donna Reed (Mary Hatch Bailey), Lionel Barrymore (Mr. Potter), Thomas Mitchell (Uncle Billy), Henry Travers (Clarence), Beula Bondi (Ma Bailey), Frank Faylen (Ernie Bishop), Ward Bond (Officer Bert), Gloria Grahme (Violet Bick), and H.B. Warner (Mr. Emil Gower). The page is also one of the more valuable items Goodson owns. “You just never see [those names] together,” he said. “You just know that had to be in all of their hands at one time.” Goodson also said he likes the nearly 400 original movie stills he has acquired over the past two decades. Christmas ornaments autographed by Karolyn Grimes (Zuzu Bailey) hold a special place in his heart as well. He often gives them away as gifts. In fact, Grimes and Goodson have been friends for years. The actress said she rarely meets collectors with such an honest love for the film. Though unsure of what he ultimately intends to do with his collection, Goodson has let others use his items for fundraising and literary projects. He just wants to keep the movie’s message alive. Clarence was George Bailey's guardian angel in the film.